About Selkirk Sport: Selkirk Sport, a Made-in-the-USA Manufacturer of Pickleball paddles and accessories, is a family-owned and operated company based in Hayden, Idaho, located in the shadows of its namesake, the Selkirk mountain range. Founded in 2014, Selkirk Sport is born off a passion for sport, as well as the great western outdoor leisure lifestyle that was afforded to the Company’s founders, Rob and Mike Barnes, along with their father Jim, who is Selkirk’s production manager. Backed by the philosophy of always pushing the limits, Selkirk Sport is committed to manufacturing products that deliver the highest performance with unmatched quality and service. As part of their early success, Selkirk Sport was the very first Pickleball manufacturer to offer an unprecedented lifetime warranty on its high-performance products. And, to meet the demands of the game’s premier professionals, the Company developed low-profile edgeguards that are lightweight and extremely durable. In just three years, Selkirk Sport has become one of the industry’s fastest growing companies, and their paddles are used by many of the game’s premier players, such as Tyson McGuffin, Morgan Evans, Cammy MacGregor, Kaitlyn Christian and a host of others who are premier players and national/regional champions. About Pickleball: Pickleball was invented by three dads in 1965 as a way to entertain their children during summer. The families resided on Bainbridge Island, Washington. Congressman Joel Pritchard, Bill Bell, and Barney McCallum fashioned handmade equipment and based the simple rules on the existing sports of tennis, badminton, and ping-pong. 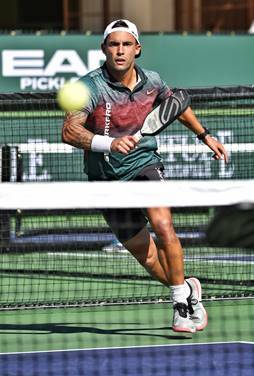 Unlike Tennis, Racquetball and many other sports, Pickleball has a short learning curve; you don’t need months of lessons to participate in a fun game. It also is less running compared to Tennis. However, at the same time, it can be very competitive and addicting for all ages, as well as an excellent, fun family activity. Pickleball can be played as both singles and doubles game, and can be played inside or outdoors, on a court that uses the dimension of a doubles badminton court, along with a modified tennis net. A Pickleball court is 20’ x 44’ for both singles and doubles. The net is hung at 36-inch at the ends and hangs 34-inch in the middle. A non-volley zone – called the Kitchen – extends 7-feet back from the net on each side.